As we head into the month of February, let's make sure we checked off our annual goal from January. If you haven't taken a polaroid picture with your goal and posted it on our goals board by the front desk, please do so. If you need help, grab a coach before or after class. All month long, we're focusing on ways to share the love with others and yourself, too! 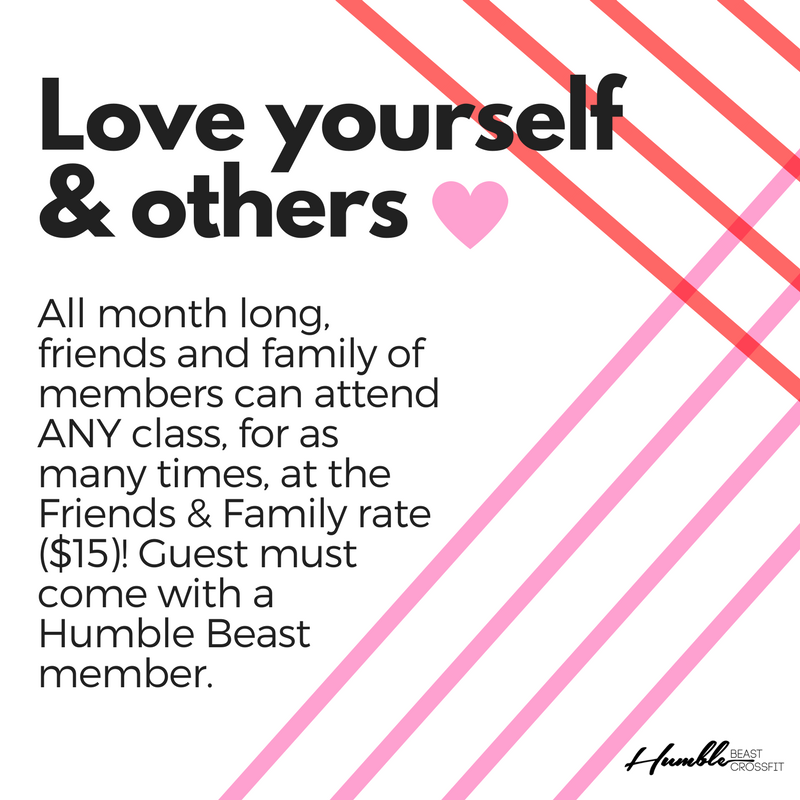 • Any friend or family member you bring with you to any class will have the Friends & Family reduced rate of $15 all month long. • On Valentine’s Day 2/14, you can bring your “loved” one to any class that day for free! • We are hosting a Self-Massage Workshop with Tamara at 12pm on Saturday 2/10 following the WOD. • Our Whole30 wrap-up meeting will conclude our diligent efforts cleaning up our lifestyle habits. You made it through the Whole30!!! Good job! You made it (hopefully). We will have a Whole30 wrap up meeting 2/22 at 6:30pm and 7:30pm to go over what's next. • We are hosting a special Essential Oils Workshop at 12pm on Saturday 2/24 following the WOD. Our guest expert, Norm, will provide an essential oil sampling and educate us on how to maximize the internal and external benefits that result from the use of essential oils. Check out the new community white board as it has listed the dates for our upcoming love yo’ self workshops! Also, take advantage of the love that our 10am yoga class can show your body every Saturday this month.